INSPIRING MOUNTAIN VIEWS IN GATED COMMUNITY! Relish in the lap of luxury and treat yourself to this gorgeous 1,654 Sq Ft home with heated pool and spa in the prestigious gated Peralta Trail community with unobstructed views of the Superstition Mountains on a cul-de-sac lot with no rear neighbors. Spacious 2 bedroom plus den, 2 bathroom home boasts bright open great room floor plan, designer paint throughout, premier tile flooring, high ceilings, large wrap around island kitchen with a breakfast bar, ample maple cabinets, and pantry. Big bayed master suite has, huge walk-in closet, double sinks, and roomy step-in shower. Ornate backyard with extended covered patio, built-in BBQ, mature low maintenance landscaping, all ideal for relaxing or entertaining. 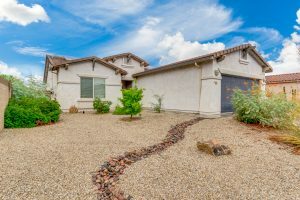 Take advantage of the miles of scenic trails, abundant nearby golf courses, easy freeway access, and so much more.